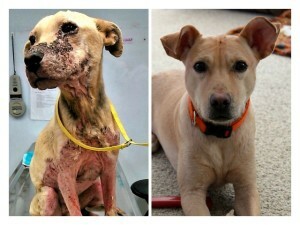 One Love Animal Rescue has announced that Buckley, an abused dog rescued last May, is being adopted. Buckley was rescued in May of 2014 by One Love. Upon intake, his physical condition was shocking to see. His face was severely scabbed, and his eyes were bleeding. His skin was red, raw, and bald and causing him tremendous pain and suffering. Shelter volunteers believed that duct tape had been wrapped around his muzzle. A comprehensive vet visit showed that the all the scabs and baldness were the result of demodectic mange and a secondary skin infection. (Demodex is a non-contagious infestation of mites.) The doctor also found that Buckley was positive for heart worm disease and lyme disease. One Love knew they were facing a long and expensive road of treatment for this victimized dog. With the community’s support, One Love raised more than $3700 to help care for Buckley. After the segment aired, One Love also received many applications to adopt Buckley. The rescue combed through many wonderful applications and decided on one deserving couple to become Buckley’s forever family. When he completed his final heartworm treatment in August, the rescue transitioned him into his new foster home with the family intending to adopt him. Since the spring, Buckley has received treatment for all of his medical conditions. Once he was well enough to handle surgery, he was also neutered. Buckley has completed both the treatment phase and the lengthy resting period required for heart worm disease recovery. Although treatment for Demodex will continue with this adoptive family, Buckley is ready to run and play and live a full and happy life with his forever family.